The rehabilitation of existing reinforced concrete (RC) bridges and building becomes necessary due to ageing, corrosion of steel reinforcement, defects in construction/design, demand in the increased service loads, and damage in case of seismic events and improvement in the design guidelines. Fiber-reinforced polymers (FRP) have emerged as promising material for rehabilitation of existing reinforced concrete structures. The rehabilitation of structures can be in the form of strengthening, repairing or retrofitting for seismic deficiencies. RC T-section is the most common shape of beams and girders in buildings and bridges. Shear failure of RC T-beams is identified as the most disastrous failure mode as it does not give any advance warning before failure. The shear strengthening of RC T-beams using externally bonded (EB) FRP composites has become a popular structural strengthening technique, due to the well-known advantages of FRP composites such as their high strength-to-weight ratio and excellent corrosion resistance. 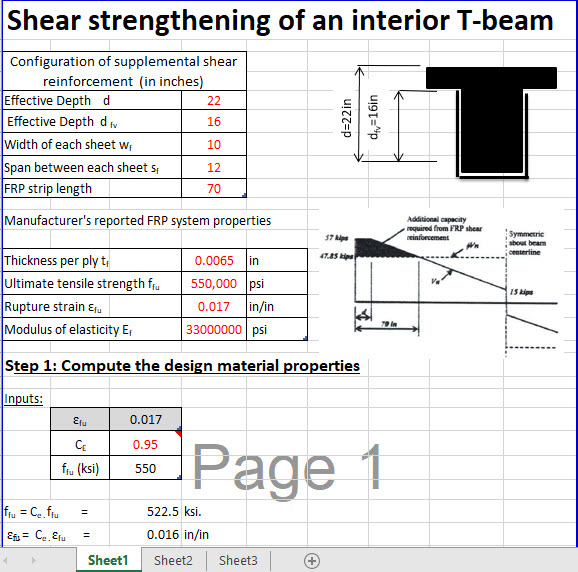 A few studies on shear strengthening of RC T-beams using externally bonded FRP sheets have been carried out but still the shear performance of FRP strengthened beams has not been fully understood. The present study therefore explores the prospect of strengthening structurally deficient T-beams by using an externally bonded fiber reinforced polymer (FRP). This study assimilates the experimental works of glass fiber reinforced polymer (GFRP) retrofitted RC T-beams under symmetrical four-point static loading system. The thirteen number of beams were of the following configurations, (i) one number of beam was considered as the control beam, (ii) seven number of the beams were strengthened with different configurations and orientations of GFRP sheets, (iii) three number of the beams strengthened by GFRP with steel bolt-plate, and (iv) two number of beams with web openings strengthened by U-wrap in the shear zone of the beams. The first beam, designated as control beam failed in shear. The failures of strengthened beams are initiated with the debonding failure of FRP sheets followed by brittle shear failure. However, the shear capacity of these beams has increased as compared to the control beam which can be further improved if the debonding failure is prevented. An innovative method of anchorage technique has been used to prevent these premature failures, which as a result ensure full utilization of the strength of FRP. A theoretical study has also been carried out to support few of the experimental findings.